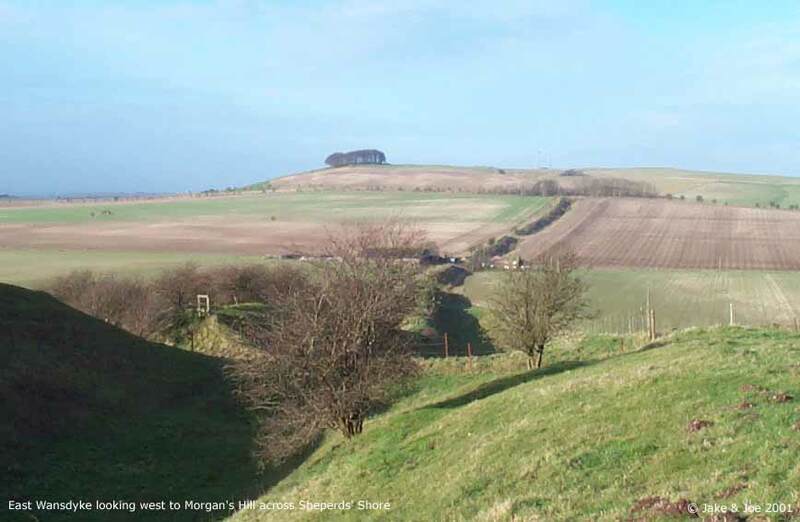 If we do not take into account any connection between Wansdyke and the Roman Road, the eastern section, commonly known as Wiltshire Wansdyke or East Wansdyke, starts at Smallgrain Plantation. 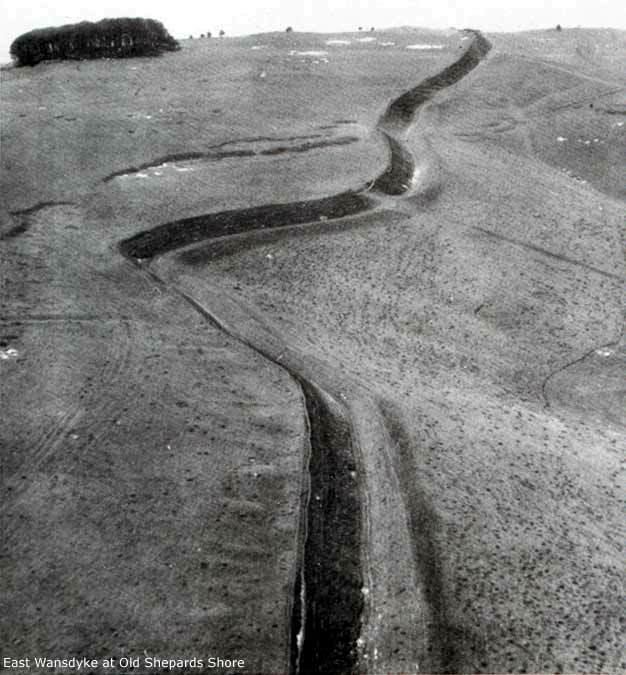 Where a farm track crosses its line, the rampart can no longer be traced to the west, and especially Fox & Fox believed that heavy wood cover during post-Roman times had made any defensive linear construction superfluous. A quarter of a mile to the east, Wansdyke and the Roman Road part ways, the latter heading east to London. This is Morgans Hill, and the reason for the connection of both at this point becomes apparent immediately when you visit the area. It has long been recognized that one of the main goals of the builders of Wansdyke was the control over all roads and tracks in the area. At this point, the hill is so steep that any alternative for the users of the Roman Road is denied them by Wansdyke, which cut right through the road surface. 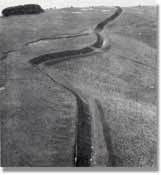 In other words, Wansdyke destroyed the Roman Road and made it impassible. The picture shows how the Roman Road virtually has no other place to go and is following the fence to the left. The map (click here to enlarge) shows how it was blocked by Wansdyke. At this point, Wansdyke takes on its most magnificent form. 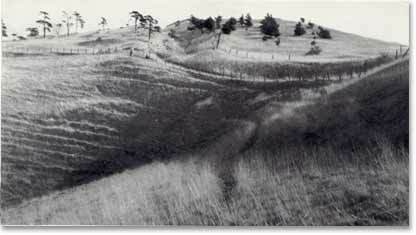 Situated on the west flank of Morgans Hill, it runs across the forward slope well above the 600 ft contour. The steep-sides combe where it starts is such a natural obstacle that is must have been sought out as a termination point (or at least the point where to block the Roman Road), rather than encountered by chance. Wansdyke now climbs Morgans Hill, but immediately we see an odd thing; it crosses the hill on the reverse rather than the forward slope! This sure is strange, for the hill-crest blocks the view to the north. Though Fox & Fox explain this was done to prevent the creation of a useless salient, a look at the map shows it could have been done better. Apparently, the view north was not that important, something we have already encountered with West Wansdyke. 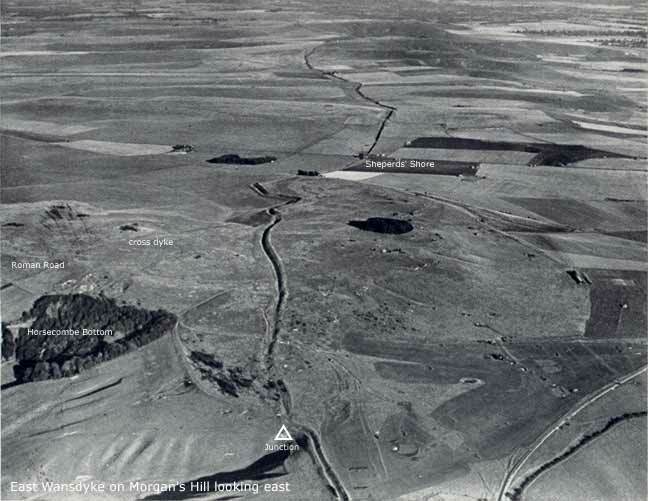 Between Wansdyke on Morgans Hill and the Roman Road in the valley below, a linear cross-dyke can be seen. 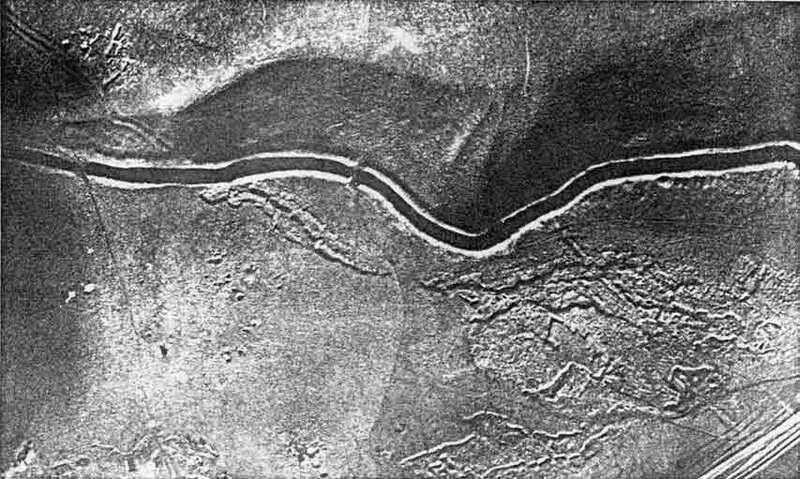 The function and date of this earthwork is unknown, but at this point Id like to suggest a predecessor to Wansdyke, which blocked the valley in a similar way. Pitt-Rivers dug here in 1889 (click here to enlarge the air shot of his section), and found Romano-British pottery below Wansdyke, thereby establishing its Late or Sub-Roman date. Descending Morgans Hill, Wansdyke makes a few short, winding turns, which may have been caused by the presence of older earthworks. This part of the Downs is littered with them, dating from the Iron Age, the Bronze Age or even further back in time. Enclosures, cross-dykes, raths and hillforts all point to a prolonged agricultural use of this area, and most of the remains are not necessarily defensive. One of these is a strange, square enclosure, which Wansdyke passed to the south. Some have explained this as a Roman relic, though a medieval origin has been put forward as well. 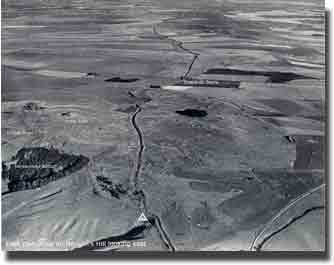 Wansdyke has by now regained a full view to the north and east, as it reaches Old Shepherds Shore, as we can see in the 1956 picture (click here to enlarge). A shore is the local name for an original gap in the dyke for a road to pass through, in this case the medieval version of the London-Bath road, the old Bath road in 1635. 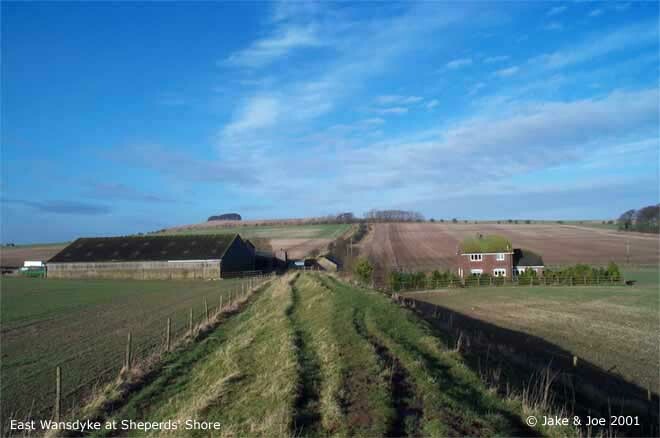 Though this was probably not contemporary with the building of Wansdyke, Crawford suggested that the exact track of the Roman Road may have been left during Roman times, and a track or a road may indeed have existed here when Wansdyke was constructed. For the next half a mile, Wansdyke crosses the dry valley at Shepherds Shore, which is the most easily accessed by the modern Devizes Road. East Wansdyke at Shepherds' Shore (click here to enlarge). East Wansdyke looking west to Morgan's Hill, across Shepherds' Shore (click here to enlarge). Directions to Section 7 can be found here. Follow Wansdyke further through Section 8. Several images by kind permision of Jake Livingstone and Joe Boyles.